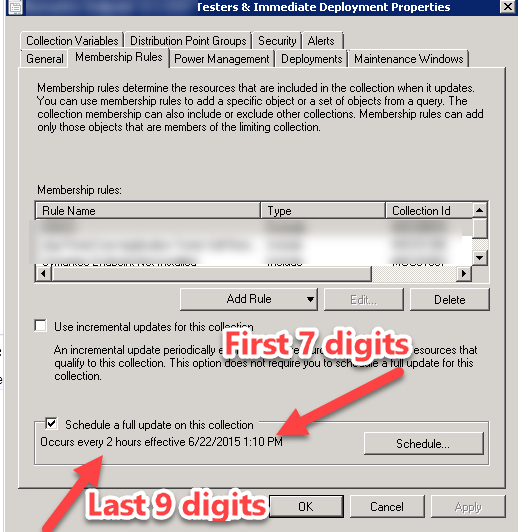 There is no real readable output of the SCCM Collection schedule for us to understand. What is produced is 16 character string. If you want to really find out what this translated to then you have to look into the SDK for translation. Also, there really are not any good existing reports/queries out there to cover this information via SQL. This is the query I came up with for my customers environment when trying to evaluate their SCCM Collection evaluation problems. Also I will do another blogpost with the sql queries to identify a number of other items to include orphaned collections, SCCM Collection update types, etc… There is a screenshot in the bottom of this post to give a preview of the information. There schedule produced “29B66B4000100200” is not readable. You have to look up this information in the SDK to start to get an understanding. NOTE: I did not put a case when statement for every possible outcome, only the ones that exist in my customers environment. If you want to look up what schedule is used for a specific SCCM Collection then modify the where statement to site that specific SCCM Collection name. I plan on in the near future releasing a revised version where you can see update times over the last 7 days included.